On Saturday, January 14, 2017 at approximately 1:50 p.m., officers were dispatched to the intersection of 15th Street and Western Avenue for a report of an accident. 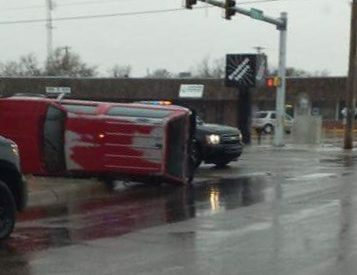 It was reported that a vehicle had struck a pole and flipped onto its side. Investigating officers discovered that a 1987 Chevrolet Blazer, driven by a 16 year old male, and a 1995 Chrysler LeBaron, also driven by a 16 year old male, were racing on Western Avenue. The driver of the Blazer lost control and struck a guide wire, causing the vehicle to flip onto its side. No injuries were reported. The driver of the Blazer was issued citations for racing on highways and illegal tag. The driver of the LeBaron was issued a citation for racing on highways.